The EM Series is designed for maximum versatility. This press side granulator is operator friendly, easy to service and maintain. Precision scissor cut action provides maximum through-put efficiency. Height To Infeed Tray: : 53"
Height to Robotic Feed: : 65"
2. Full load amps are higher than run load amps and must be used for sizing disconnects and supply wiring. Not for construction. Consult factory for power requirements of unit as configured and on selected options. 3. Consult factory for 50HZ operation. 4. Unit weight crated for shipment. Combination hopper for front (manual) feed or top (robotic feed). Hinged for easy opening for cleaning and servicing. D2 high carbon / high chrome tool steel. Engineered to meet 90 DBA or less for most materials. Special steel/plate/steel laminate to reduce resonant noise. Tangential feed design to reduce fly back. 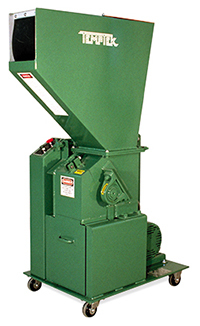 Separated from cutting chamber to eliminate heat build-up or grease contamination from granulate. Hopper and screen cradle are electrically and mechanically interlocked with a time delay safety bolt. Knives mounted at a steep angle and counter angled to provide a precision scissor cut. 1 year on parts and labor. Nationwide network of service contractors.